'Aviation Nation' is Nellis Air Force Base's annual Open House, and Nevada's largest free public event. This year it was held over Saturday 10th and Sunday 11th November. 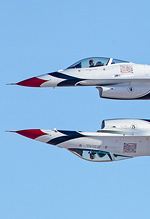 Nellis AFB is located 15 minutes to the north east of downtown Las Vegas, just off I-15, and is home to a number of units including the 57th Adversary Tactics Group, the 443nd Test and Evaluation Squadron and the USAF's Air Demonstration Squadron, the Thunderbirds. 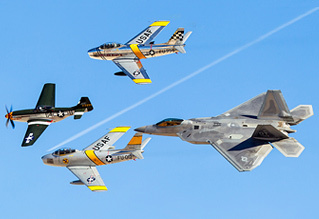 Keith Meachem wrapped up his airshow season in style at Nellis AFB, Nevada. Parking for the show was at the nearby Las Vegas Motor Speedway, with visitors taking a five minute bus ride from there to the base. The whole set-up was smooth, with buses running continuously throughout the day to and from the Speedway. The gates opened at 09:00, with the flying display starting at 11:30 running though to around 15:30. We arrived and parked up just after 07:00 both days without any problems, and were on the first bus to leave the Motor Speedway for the base. The weather was unseasonally cool both days, with Saturday being overcast for periods of time. Fortunately the rain which you could see over Las Vegas and Mt Charleston in the afternoon stayed to the west and didn't reach the show. Sunday's show fared better, enjoying clear blue skies throughout the day. With 90 minutes between gates opening and the flying display, there was plenty of time to view the aircraft in the static displays, which ran the length of the crowd line and featured most front line USAF types. The USAF's Thunderbirds museum, which normally isn't open to the public, was also open on both days. The layout of the static park was good with plenty of space between the aircraft, ideal for photography. Up at the 21 runway end were the transport, communication, surveillance and tanker aircraft, whilst down at the 03 runway end were the bombers and helicopters. Barriers around aircraft were kept to a minimum, with good access to a number of the aircraft. The foreign participation this year was provided by our own RAF and Army Air Corp, with a Merlin and Lynx respectively. There were a number of 'Aggressor' aircraft present from the local 64th and 65th Squadrons. In addition to the local s, an F-16 from the 18th Sqn, Eielson AFB Alaska, in it's striking white, grey and black scheme was also in attendance. The air show followed the same schedule both days, the flying display lasting approximately four hours with nearly continuous flying. 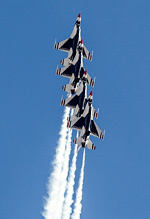 The only break was when the Thunderbirds carried out their ground show, before displaying. The show started with the U.S. Air Force Academy's Wings of Blue Parachute team jumping from a C-130. This was followed by a Korean War re-enactment consisting of a P-51 Mustang, T-33 Shooting Star, F8F Bearcat, T-6 Texan and a Yak 9. After the re-enactment, the T-33, flown by Greg Colyer, went on to fly a solo display with some great low passes along the crowd line. Next on was the first of the three display acts, the Desert Rats team flying a quartet of Chinese CJ-6 Nanchang aircraft. This was followed by Clay Lacy, in his Special Ops Learjet, who flew a very spirited display in what is essentially a business jet. The second display team of the day, The Horseman demonstration team, flying trio of F-86s. As with The Horseman's P-51 display at Duxford last year, the routine was performed to James Horner's specially commissioned score. The Horsemen flew a superb display both days, with close formation flying and solo displays. 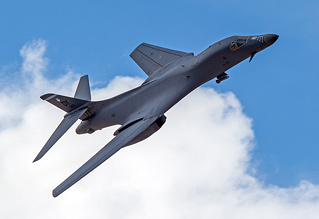 The heavy metal of the show came from a Dyess based B-1B Lancer. In total it performed three flypasts, the final one a nice swept wing topside pass arcing round the crowd line. Having so many local units, there were a couple of role demonstrations showing off the some of the USAF's current capabilities, and the work carried out at Nellis AFB. The first was an air-to-air demonstration featuring a pair of Aggressor F-16Cs (64th Sqn) against a pair F-15Cs (433rd WS Sqn). The second demonstration showed off the air-to-ground capability, utilising A10s, F-16Cs, F-15Es and MH-60s. The final solo act of the show was Air Combat Command's F-22 Raptor demo. It was flown by Major Henry "Shadow" Schantz. 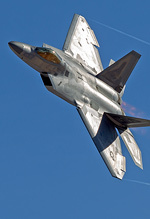 This was his last show as the F-22 demo pilot, and he put on a superb display showing off the F-22s capabilities. The show was closed both days by the USAF's Thunderbirds who, as always, put on an excellent exhibition of formation flying and solo displays. 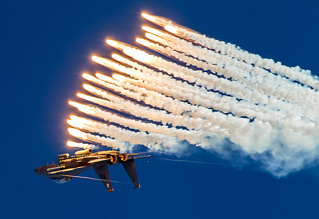 As a photographer I thoroughly enjoyed the show and found it a nice relaxing way to finish of my air show year. The photo opportunities were excellent, with the crowd line facing Sunrise Mountain. It was difficult to judge the crowd size, but Sunday was the busier of the two days, possibly due to the weather. I'd like to thank the USAF, and especially the 99th ABW, who were great hosts and I can't thank them enough.